Pro Fortran builds faster code with exclusive Dynamic AP load balancing, SMP analysis, and advanced optimization. The AbsoftTools integrated development environment speeds program development and maintenance. Complete command line development support is also provided. 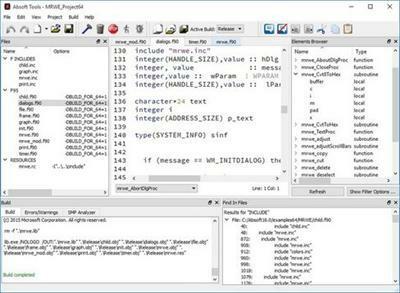 The Windows Fortran compiler supports a full range of project targets including command line programs, GUI based applications, and Windows DLLs. It provides a complete 32 and 64 bit Windows Fortran compiler solution and supports mixed language development by interfacing with the Microsoft Visual Studio and Windows SDK C/C++ compilers.